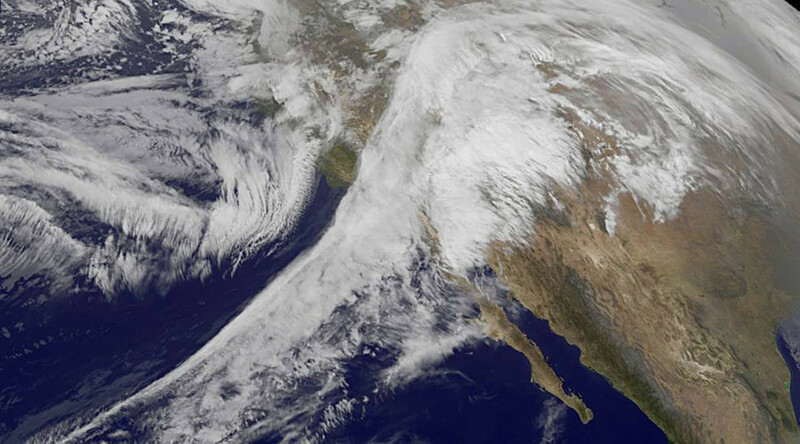 While the weather outside may be frightful – the western US is freezing under several feet of snow from the lashing of Winter Storm Iras and other weather troubles to come – the view from space is quite delightful. The satellite animation of visible and infrared imagery, captured by NASA/NOAA’s GOES project, shows a powerful rhythmic storm of snow undulating across the Pacific Ocean driving across to the Pacific Northwest to blanket the region in snow. As the storm moves across the Pacifica Ocean a low pressure area is seen churning in a playful anti-clockwise eddy off Canada’s west coast. One person died on slick road in Washington and several other sustained serious injuries. A woman is believed to have died from exposure due to cold temperatures in Oregon. An 11-year-old boy was hurt when he was ejected from an automobile. According to the Weather Channel, in California, 25 inches was reported in Mammoth Lakes, while in Colorado, an estimated 18.2 inches fell in the higher terrain near Steamboat Springs. In Idaho, 12 inches fell in Haily, while Montana saw 6.5 inches. Further west, an estimated 20 inches fell on Paulina, Orgeon; Cle Elum, Washington recorded 14 inches; while Nevada saw 5 inches near Incline Village. The winter storm is being blamed for a number of crashes and the westbound lanes of Interstate 84 from Ontario to La Grande in Oregon was closed Monday, according to the AP. The storm in California is causing flooding and mudslides. Iras is expected to continue through midweek and bring more rain and snow.